During 1847 and 1869, members of The Church of Jesus Christ of Latter-day Saints from all over the world immigrated to the Salt Lake Valley and environs to escape religious persecution, to join with the main body of the church, and to strengthen the church. The Mormon Pioneer Memorial Monument is dedicated to the more than 6,000 pioneers who died making the journey. 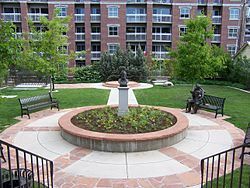 The monument is located in a one-acre cemetery on First Avenue in Salt Lake City. It is known as the Brigham Young Cemetery because Brigham Young, second president of the Church of Jesus Christ is buried there. Brigham Young was born in 1801 in Vermont. In 1847, he led the migration of members of the church from Illinois to Utah. The first president, Joseph Smith, was martyred in Illinois in 1844. Within a few years after settling in the Salt Lake Valley in the Utah Territory, Young sent members of the Church of Jesus Christ to colonize surrounding areas, including Arizona, Idaho, and Nevada. He was territorial governor from 1850 to 1856. Young died in 1877 and was buried in a corner of his own property that had been designated as a graveyard. The site once overlooked Young’s homestead and the Salt Lake Valley. The Young Men’s and Young Women’s Mutual Improvement Associations, which Young had organized, added the bronze marker in 1938. Approximately eleven other people are interred there, including six of Brigham Young’s wives and two of his sons. Possibly more of his children were buried there because ten of his children died in infancy or childhood. Richard W. Young (one of President Young’s descendants) deeded the property to the Church of Jesus Christ in 1927 with the stipulation that the burials not be disturbed. On June 1, 1974, the 173rd anniversary of Young’s birth, N. Eldon Tanner, of the First Presidency of the Church of Jesus Christ, dedicated the cemetery. The cemetery was restored and redesigned in 2000. At that time the statues and two monuments that remember two hymn writers were added. One of the monuments is dedicated to Eliza R. Snow, who wrote many of the church’s hymns. She was also president of the Relief Society for twenty-one years. She was married to Joseph Smith until his death and then married Brigham Young. She is buried in the cemetery. The other monument is dedicated to William Clayton, the author of the hymn “Come, Come Ye Saints.” He is buried in the Salt Lake Cemetery. This page was last edited on 31 July 2014, at 17:43.